The owners of Sloka Deck will get its 2nd and 3rd editions free. They can also purchase Deckcelence , Amazers with Karma Deck , Suit Order Systems 1 and/or Suit Order Systems 2 for half price. Sloka Deck is a mnemonic deck based on probably the world's smallest mnemonic for a full deck card stack. A practical alternative to brute memorization and math rules. This creates an almost instant stacked deck for you. 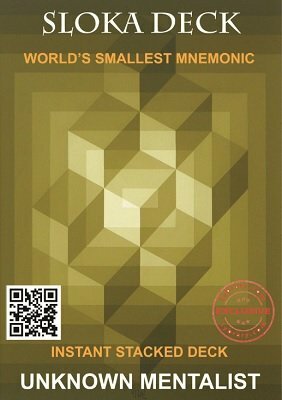 Very tiny and yet powerful mnemonic holds the key to your 52 cards. An easy and practical rule is embedded into this tiny mnemonic to aid instant recall. You will be able to know the entire stack within minutes of reading the instructions. Basically, given a card you can instantly know the previous and next cards. And with a little visualization, this can be used as a memorized deck system also. This "micro mnemonic" is not only easy to remember but very difficult to forget. So even if you do not do stack magic regularly or have to do it after a long time, it is unlikely that you will ever forget it. The mnemonic is so convenient that you do not even need a deck of cards to practice. You can use a piece of paper and pen or just practice in your mind. Sloka Deck works fine with existing suit systems like chased, shocked etc. An innovative method to randomize the suits is included. Alternately, you can choose to use the suit systems given in my SOS 1 and SOS 2 . In addition, the second edition contains alternative mnemonics, a couple of routines, a new technique 'Sing Read' which is a reverse process of readings and a list of routines of various creators which can be done with Sloka Deck , compiled by David Burmeister. Almost all the routines available out there for stacked decks can be performed with the Sloka Deck . 1st edition 2015, 2nd edition 2016, 16 pages. Last month, I attended a Parent-Teacher Meeting with my niece in her school (she is in 6th grade). There we got to watch an amazing memory demonstration by a couple of her classmates using a deck of playing cards. It was still more amazing when I found out that the kids who did it had pulled it off with just a couple of hours of practice with the help of one of the teacher's father (who happened to be magician). On probing a bit further, I got to know that they had used the Sloka Deck method. I just couldn't wait till I got home and immediately got this. And what a simple method to memorize a stack. I could memorize the entire stack in under half an hour. Fantastic system. Have been using it since then with great success. Not to be missed. The Unknown Mentalist has great effects that you wont go wrong with. Some of the material that I specifically like are the following: SLOKA DECK, 13 MM of Si Stebbins, YOGIK Deck, KARMA Deck, Amazers With the Karma Deck, DARK HORIZON, SQUARE SKILLS, BRAIN KNEWMEROLOGY, ADVANCED BRAIN KNEWMEROLOGY, SENSORY BRAIN KNEWMEROLOGY, and KUBE RISHI. This is GREAT MATERIAL from a GREAT GUY and personal friend by email. I can't wait to see what he comes out with next. Out of 5 stars I would give him a 10 star rating for the quality of the material AND the price. Among the mnemonic stacks the 8 Kings is the most popular and it had taken me about 3 days to completely get it by heart (way back in those days). Of course my memory and math both are very poor. But shockingly it took me just 3 minutes flat to get the Sloka Deck into my memory. And no math rules. A very smart and clever way of learning a stack is the Sloka Deck. This is a simple but useful advance over traditional mnemonic systems for deck stacking; its advantage lies in brevity and simplicity. An alternate system suggested for suit arrangement is also intriguing. The author seems to be bubbling with creativity. I have thoroughly enjoyed his recent string of innovations in stacKing like Karma Deck, Rasik Deck & Yogik Deck. And now Sloka Deck is a brilliant offering especially for those beginning in stack magic or for those wanting to quickly acquire a second stack. This STACK KING has taken STACKING into a new realm of advanced science & art and yet retaining the simplicity of idea and ease of performance. The Sloka Deck principle is so simple and clever that it immediately catches onto you. It is so addictive. Once you read about it you simply cannot stop remembering it or knowing it. There is nothing to learn or spend hours memorizing. You read it, you get it. Just like that. Wow ! The unknown mentalist's un-stacked creative mind is coming with various types of stacked decks and the latest one being the SLOKA DECK. It is really the smallest mnemonic deck in the world and it is equally easy to master. All the best to him. I really liked this for its simplicity, well thought, simple, easy to remember, tips to remember duplicate letters. All this makes system easy to master. A powerful aid for professional Mentalists, performing with cards. looking forward for many more creative ideas like this.